Can I send photos to a SkyDrive album via email? Update 6 April 2012: As of May 2012 this feature will no longer be available. Yes, you can send photos to your SkyDrive albums via email. Windows Live SkyDrive offers a large amount of free storage and some nice photo album features. Normally you upload with a drag-and-drop procedure or, even easier, directly from Windows Live Photo Gallery. 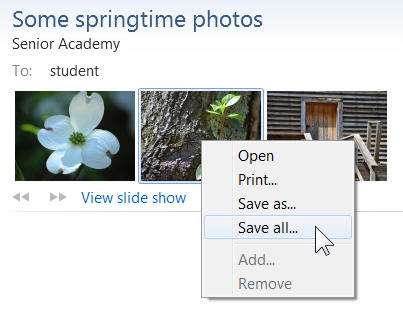 Sending photos to a prime-level SkyDrive album via email is another very useful option. The procedure must be enabled first. Log in to your Windows Live account. In the upper right corner click on your name. In the drop down menu, click Options. See the red pointers in the illustration here. On the options page in the lower right corner find and click Email publishing. This takes you to the Email publishing page. Most of the page is greyed out until you click the Turn on email publishing check box. 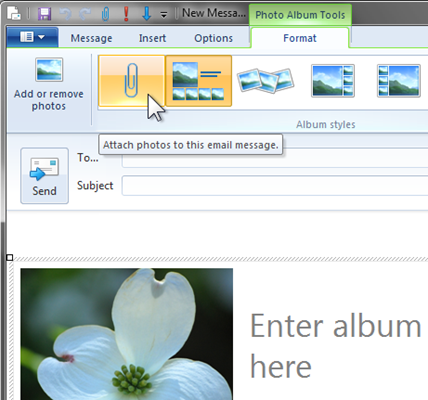 Enter the email address (up to three) from which photos can be sent to a SkyDrive album. Note that photos sent from any other address will not be delivered to the album, the email will just be lost. Select album codes. This is an optional step, codes, three-digit numbers, are pre-assigned to your albums. You can change these, but the ones offered will work just fine. Once you have saved the information, there will be a display of the email addresses for sending the photos. Each album – and this is only for the prime-level albums, it does not work for albums inside other albums – has a unique email address. 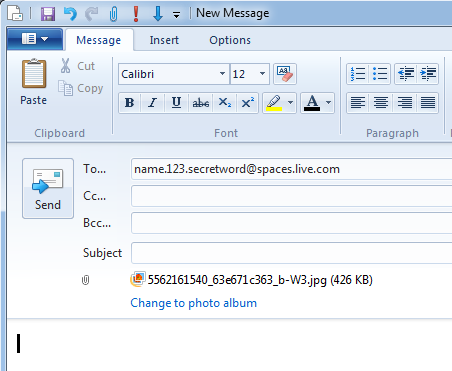 The address looks like this: name.album.secretword@spaces.live.com. Where name is a name derived from your name, it may be slightly different from your user name – be careful with that! The album will be the three digit album number (or other, if you changed it) to identify which album it is. The secretword is the word that you specified. To send photos to an album you must originate the email from an email address you specified on this page. Attach the photo or photos to the email. Do not use the Photo album feature in Live Mail. Do not “Change to photo album”. Be sure to use the correct email address from your Email publishing page. If using Hotmail use Insert: Attachments, do not use the Photos link. Enter a subject and message if you like so you can find and see the email in your sent messages. Only the photos get to your album, no messages, no hint that they were sent via email. Only JPG photos can be sent to albums, this does not work for sending documents, just pictures. 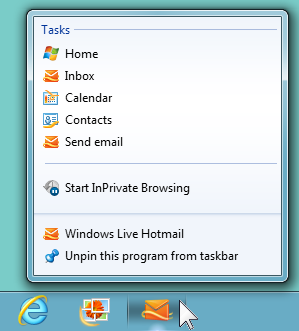 Can I pin my Hotmail Inbox to the Taskbar? For users of Windows 7 and Internet Explorer 9 it is easy to pin a Hotmail icon to the taskbar or to create a link on the desktop. This makes access to online mail just a click or two away. Using Internet Explorer 9 sign in to your Hotmail account. Move the pointer to the small icon in front of the web address in the address field. Note the little message balloon that says: “Drag to taskbar to pin site”. As you drag the – now larger – icon across an empty space on your desktop the message now says: “Create link in Desktop”. You can do that by just dropping the icon on an empty spot. This gives you a desktop shortcut. If you continue the drag to the taskbar, the message now says “Pin to Taskbar”. Just drop it on the taskbar. The desktop shortcut when double-clicked starts your browser and takes you right to your Windows Live home page (if you selected “Keep me signed in” when last you signed in to your account). When the icon on the taskbar is clicked it also takes you to your Windows Live home page. 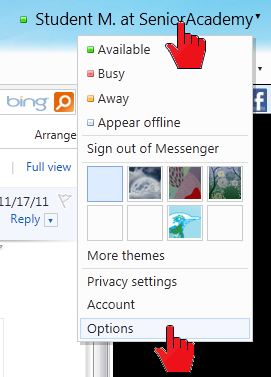 Right-click the taskbar icon and the jump list shows the options Home, Inbox, Calendar, Contacts, Send email. This makes getting to those services really easy. There is another little feature that you might find useful. When you launch your browser from the taskbar or the desktop link, a small icon is placed in front of the Internet Explorer 9 “back” button and the little “home” icon on the right is removed. The message balloon for that link also shows you the keyboard shortcut method for getting to your home page, Alt+Home. So, wherever to roam to on the Internet, you can get right back to your Windows Live home page. Windows Live Photo Gallery together with Windows Live Mail provides “Photo Email” for sharing pictures in an efficient and pleasant way. I described the feature a while back (links below). But sometimes you might want to send pictures as attachments to an email. 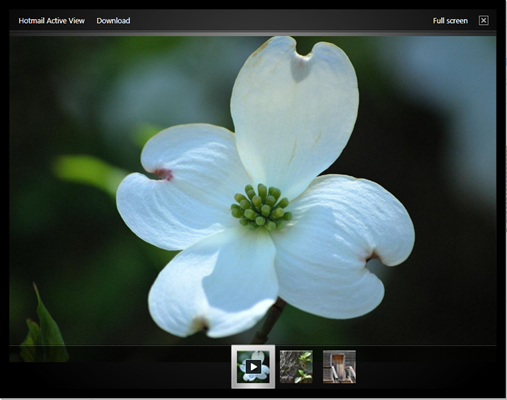 In Windows Live Photo Gallery, select the photos. Click the text part (or the down arrow) of the Photo email command. On the little drop-down menu click “Send photos as attachments”. See the illustration here. Next you will be offered to specify the image size to be sent. The default size is 1024 by 768 pixels (the maximum dimensions, if an actual dimension is smaller that will be retained). 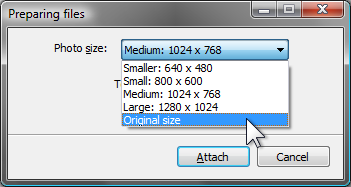 You can select Original size or several other sizes. After you have clicked the size you want click Attach. Your default mail client “new message” window will open with the photos already shown as attachments. If Windows Live Mail is your default client, it will come up with the Photo Album Tools tab active and showing that the photos are attached. 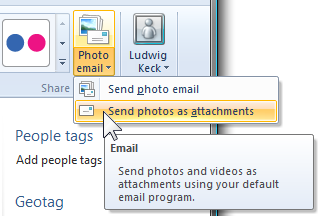 You have the option of changing to a photo email instead of sending them as attachments. The Live Mail “New message” window permits you to change from photo email to the attach method even if you started out specifying the photo email option. The “paper clip” icon in the “Album style” group specifies “attach”. Clicking on any of the other styles makes the email a photo email. The illustrations here show the options in the Photo Album Tools tab. To make the tab visible click on the photo layout in the message area of your email. 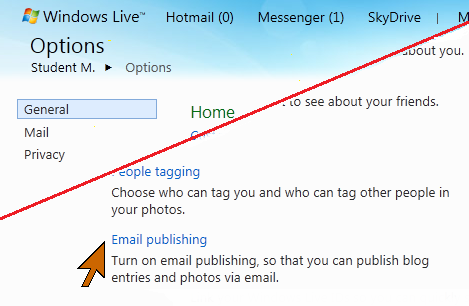 When sending pictures as a photo email or by attachment, the Windows Live Photo Gallery “publish” options are not applied. Any metadata in the image files will be retained in the photos and sent to the recipient. If you do not wish to share such data remove it from the file before sending it. Also see: Set Photo Gallery to remove sensitive data from photos prior to uploading. The recipient of the email with photos attached gets the message and all the attachments. That is the time-consuming and often annoying aspect of attachments, since they are downloaded to the recipients computer before the recipient can see the email. 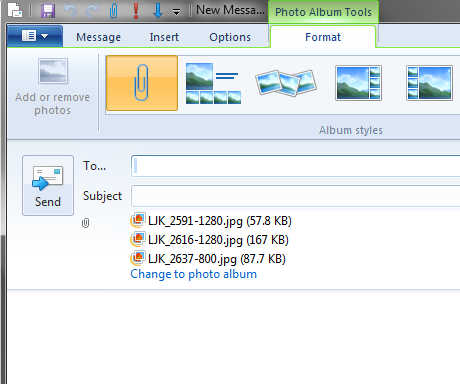 In Windows Live Mail, attached photos are shown by small thumbnails (except for very large files). To save the attached photos the recipient can right-click and select the appropriate action. When using Hotmail in a browser, similar thumbnails are displayed. 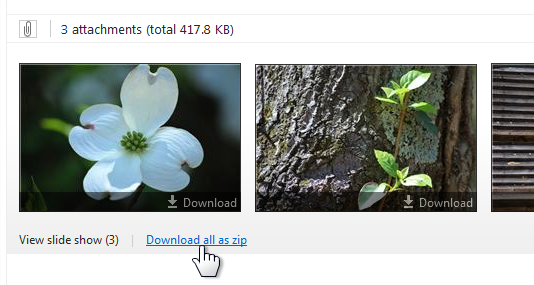 There is a download option shown on each, or all the photos can be downloaded as a zip file. There is a nice viewing feature called “Hotmail active view” which permits viewing the individual photo, or a slide show of all attached photos. This allows the recipient to see and enjoy the pictures without having to download them. You may wish to also see my post Photo Email–from Photo Gallery to Friend’s Inbox or my article at Microsoft based on that post: Explore Windows – Photo Email.